As a straight-up recreation of the Minimoog, though, it's already a resounding success: that legendary low end is well reproduced, and there's plenty of warmth and analogue authenticity in evidence. Great Minimoog emulation. Warm, authentic tones. Needs Audiobus support (though we imagine it's on the way). Arturia's line-up of virtual synths seems like such a perfect fit for the iPad that we're amazed they haven't "done an IK" and started porting them over long before now. 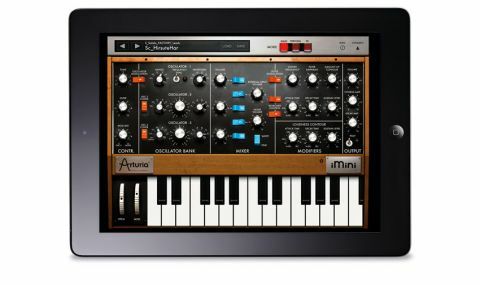 At last, though, the veteran French developer has boarded the App Store bandwagon with iMini, an emulation of one of the greatest analogue synths of all time: the Minimoog. Developed in conjunction with Retronyms, installing it also makes it available in the latter's (free) Tabletop software studio, which is a sweet bonus. "A library of around 500 presets is onboard, and communication with the outside world can be achieved using MIDI and WIST"
So, what we have here is a consistent take on Moog's 70s classic: three oscillators, a resonant filter (capable of self-oscillation, impressively), filter and amp envelopes and a white/pink noise generator. Two Keyboard Control switches enable variable filter keytracking, and a hidden settings panel enables scrolling and zooming of the keyboard, as well as scale selection (including a sizeable array of modes and non- Western scales), pitchbend Range, and On/Off switches for Decay (which activates a release envelope stage), Legato and Glide. Unlike the original, of course, iMini is polyphonic (except when running in Tabletop, where it's monophonic, disappointingly). A library of around 500 presets is onboard, and communication with the outside world can be achieved using MIDI and WIST. There are also delay and chorus effects built in, plus a pair of X/Y touchpads for assignable performance control of up to four parameters at once, and an arpeggiator.